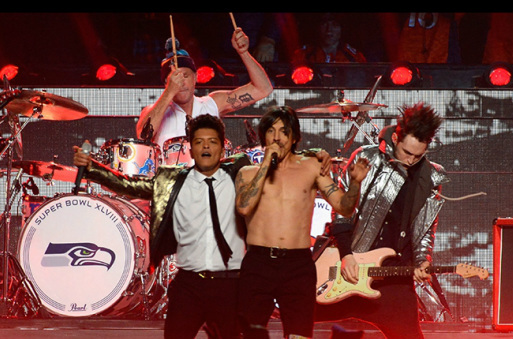 Bruno Mars and the Red Hot Chili Peppers lead singer, Anthony Kiedis, rock the halftime show. On Sunday, Feb. 2, the 48th annual Super Bowl NFL Championship fell far below expectations. With a one-sided final score of 43 to 8 in favor of the Seattle Seahawks and only a few good commercials, the night's last hope for quality entertainment was the highly anticipated halftime show starring Bruno Mars and the Red Hot Chili Peppers. The Red Hot Chili Peppers are one of the best-selling rock bands of all time, with hit songs like “Californication”, “Snow”, “Under the Bridge” and “Scar Tissue”. They have won seven Grammys throughout their career and in 2012 they were inducted into the Rock and Roll Hall of Fame. The show opened with a children's choir softly singing “Billionaire” and transitioned into an amazing drum solo performed by Mars himself. The rest of the performance consisted of Mars’ top songs such as “Locked out of Heaven”, “Runaway Baby”, “Just the Way You Are”, and a short rendition of the Isley Brother’s “Shout” which segued into the Red Hot Chili Peppers song “Give It Away”. Growing up as an Elvis Presley impersonator, Mars was accustomed to the style of the 60’s and easily incorporated it into his performance. From his clothing and pompadour (60’s male hair style), to his James Brown fancy footwork, it was clear that he was trying to portray a beloved music era. And boy did he do it! For a moment, I thought my Dad had changed the channel from the football game to the musical “Hairspray." And even with Mars and his ensemble's over the top gold lamé suit jackets, the performance never lost focus on the extraordinary quality of the band and the singing. Before the final performance, a video of multiple servicemen and women dedicated the final song to their loved ones back home. Reminding everyone to cherish and be thankful for the loved ones in our own lives. Mars’ final song was a heart-warming and heart-stopping performance of “Just the Way You Are” where he “killed” the ending with his customary girl-ish high notes and an impressive firework show. Ten years after Janet Jackson’s notorious 2004 performance with Justin Timberlake and one year after Beyonce’s epic “Countdown” performance, Bruno Mars teamed up with the Red Hot Chili Peppers and gave them a serious “run for their money” that no doubt paid off and will be remembered for years to come. Although most of the commercials were so-so, some of them proved to be a big hit. For example, one of the most memorable commercials of the night was the Budweiser “Puppy Love” commercial. It begins with a yellow Labrador puppy that is up for adoption. One day he runs away next door and makes friends with someone unusual, a Clydesdale horse. The puppy immediately bonds with the horse before being unwillingly returned home. The next 30 seconds of the commercial consists of multiple attempts and successes by the puppy to see the horse, always ending with his return to his owner. One day, the puppy gets adopted and put into the back of a car and as he’s being driven away the horse sees him. The horse begins jumping gates and calling to the other horses to chase/stop the car to save his friend. The driver is suddenly surrounded by giant Clydesdales and stops the car to let the puppy out. Back at the ranch, the owner of the horses hears a noise and turns around to see the runaway puppy leading all of his horses home. The owner picks up the puppy and (presumably) decides to adopt it. “Puppy Love” earned the top spot on USA Today’s Ad Meter and has been viewed online over 37 million times, far more than any of its competitors. One common theme of this year’s commercials was reunions. Dannon Oikos’ commercial “The Spill” was one of the evening’s best. It began by showing John Stamos, the Oikos spokesman, eating yogurt with an attractive woman. After getting some yogurt on his upper lip, she kisses him and licks it off. Stamos then “accidentally” drops some more yogurt onto his pants, but before things can get steamy, Bob Saget and Dave Coulier (aka Danny and Joey of “Full House”) appear unexpectedly with cleaning supplies, ruining the mood by demanding Stamos to remove his pants before the stain sets, and shattering his chances with the woman. Another reunion commercial involved the cast of the hit 90’s television show, “Seinfeld”. Filmed back at their old hangout, Tom’s Restaurant, Jerry and George bicker about their plans for watching the Super Bowl game. As Jerry stands up to leave and go to a Super Bowl party George wasn’t invited to, Newman appears. Newman, Jerry’s “sworn enemy” announces to both men that he is on his way to the same party, causing Jerry to sit back down and ruining the rest of his evening.